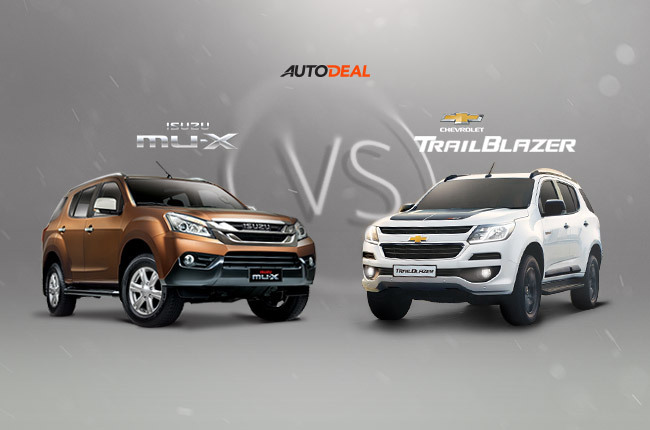 Car Comparo: Which is the better SUV, Chevrolet Trailblazer or Isuzu mu-X? You are here: Home Latest Stories Feature Car Comparo: Which is the better SUV, Chevrolet Trailblazer or Isuzu mu-X? Midsize SUVs are among the top choices of families due to their immense interior space. Among them are the facelifted Chevrolet Trailblazer and the Isuzu mu-X, which most car buyers regard as a perfect match-up due to their apparent similarities. But what really separates both from each other? With similarly priced variants, the mu-X and the Trailblazer are on the same ground. This can make it a little hard for you to discern the better choice. Luckily, there are other factors you could look at like engine size, entertainment system, and interior features. Consider this infographic below. Whether you're a new car buyer or just plain curious, this will definitely help you. For the comparison of the complete specs of both models, visit the AutoDeal Car Comparison.